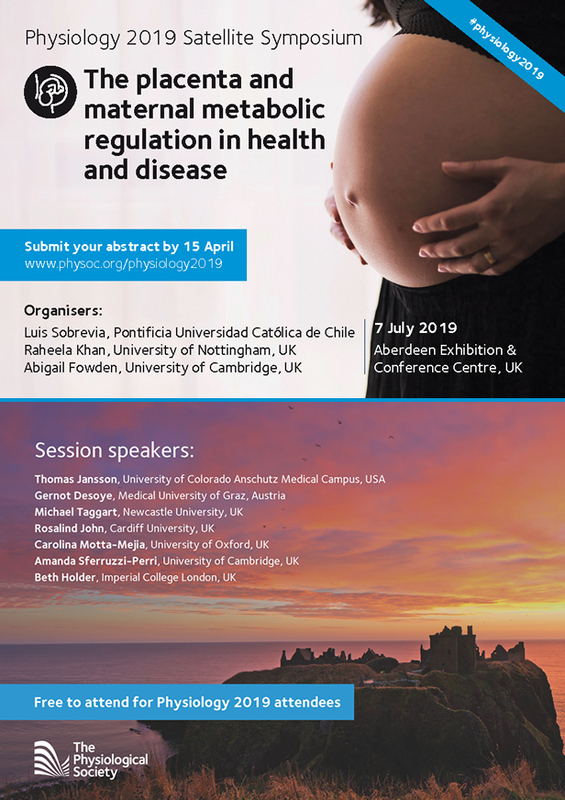 It is a pleasure to invite you to participate in the Satellite Meeting ‘The placenta and maternal metabolic regulation in health and disease’ within the framework of Physiology 2019 Congress of The Physiological Society, UK (Aberdeen). Together with Professor Raheela Khan (University of Nottinham, UK) and Professor Abigail Fowden (University of Cambridege, UK), and myself at Pontificia Universidad Católica de Chile, we are the organizers. The overall goal of this satellite meeting is to explore the nature and wider biological significance of placental endocrine function in adapting maternal physiology during pregnancy to support fetal growth in both normal and compromised environments. The Satellite Meeting is scheduled for Sunday, July 7, 2019 at the Aberdeen Exhibition & Conference Center, UK. Abstract submission deadline is Monday, April 15, 2019 (http://www.physoc.org/placenta-and-maternal-metabolic-regulation). Please note that If you have already submitted an abstract for Physiology 2019 and would like to also present this data at this Satellite Meeting there is the option to enter your control ID. Invited speakers are from the UK (Michael Taggart, Newcastle University; Rosalind John, Cardiff University; Carolina Motta-Mejia, University of Oxford; Amanda Sferruzzi-Perri, University of Cambridge; Beth Holder, Imperial College London), USA (Thomas Jansson, University of Colorado Anschutz Medical Campus), and Austria (Gernot Desoye, Medical University of Graz). – Placental programming of maternal behavior: Relevance to lifelong health. Please do not hesitate to contact me if I can be of any help.